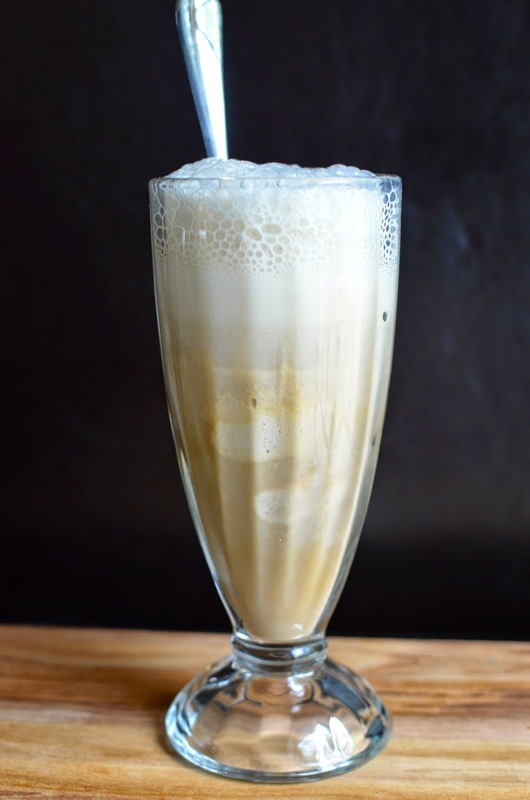 I've been hooked on affogatos ever since I started making them at home so I had to try this float version! Coffee ice cream reinforces the coffee theme but you could use another ice cream flavor (I particularly like chocolate, and there's always classic vanilla) and even spike it with a splash of liqueur if you like. 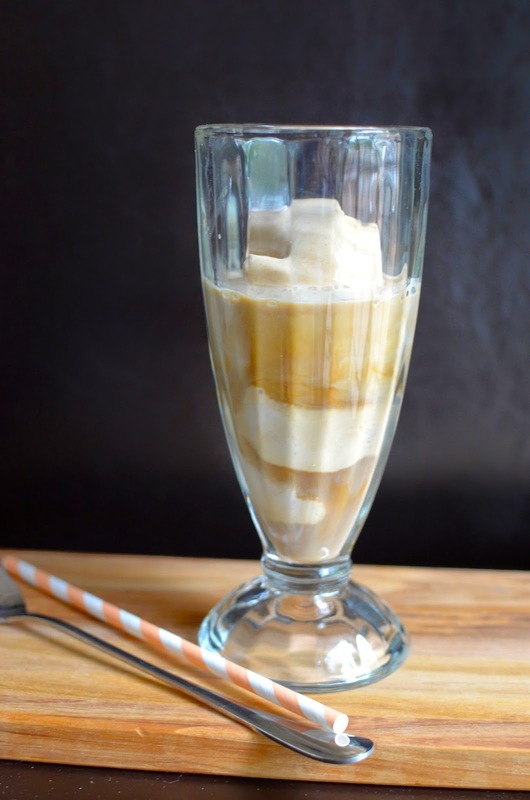 The affogato float isn't very sweet, particularly with coffee ice cream. I was wishing I had some Vietnamese coffee ice cream on hand; it's a recipe from The Perfect Scoop that uses very strong coffee and sweetened condensed milk for a very easy coffee ice cream to make at home. The sweetness of that ice cream would work very well here. Try it with chocolate or vanilla ice cream! I keep things really simple by using instant espresso powder to make the espresso. Follow it up with about a shot's worth of milk and then top it off with plain seltzer. It's not too heavy as far as "floats" goes, particularly if you choose to go with a lighter, slow-churn ice cream. Now...the grilled chocolate sandwich idea comes from baking/chocolate-expert Alice Medrich (who I have to thank for those incredible cocoa brownies); I find her column of "rogue baking tips" on Food52 really interesting. I had faith that any chocolate recipe by Ms. Medrich would likely be good, and my faith was justified. Aside from the "traditional" sandwich style for this non-traditional sandwich, we also tried a tartine, or open-face version (sort of like a chocolate bruschetta). If you're grilling outside, you could put it together on the grill for dessert. Just put some butter (or even olive oil) on the bread, grill it until nice and crispy before topping it with some chopped semisweet or bittersweet chocolate. Then, close the grill and let it cook until the chocolate is just melted. Remove it from the grill and top it with some sea salt before serving. Trying both versions, my family and I liked the 2-slice of bread, sandwich version better. There's just something about the double-crunch from the toasty bread and that delicious, warm dark chocolate filling tucked inside. Who knew a grilled chocolate sandwich would be so good! In a small heat-proof bowl, dissolve instant espresso powder with the boiling water. Place ice cream into a large serving glass. Pour in espresso and milk, then top with seltzer. Heat a cast-iron skillet or griddle pan over medium heat. While pan is heating, butter one side of each slice of bread evenly (the more generous you are, the more golden brown and toasty it will be). Flip two slices over so that butter side is down, and place chocolate on top. Top each with a slice of bread, butter side up. Carefully place sandwiches on top of the skillet. Cook until the bottom is golden brown, then gently flip and brown the other side. Remove from the skillet, slice each into two pieces, if desired, and serve immediately. Vanilla ice cream goes very well alongside. This is a GREAT afternoon snack, Monica, esp. that sandwich...can't wait to give it a try! How fun is this???? I think I need to make me a float and sandwich to celebrate the fact that it's friday! haha That float with the coffee ice cream and espresso... is it bad that I would so eat that for breakfast right now?? haha...definitely was little fun afternoon snack project for us! : ) Have a great weekend! This looks amazing! I wish I had one for breakfast! I picked the 'crazy' grilled chocolate sandwich since I figured he'd be intrigued and I knew he'd like it. I've heard of putting chocolate into warm bread and clearly, that has to be good...and this was! Have a great one! haha - thanks, Cindy. I have become a much bigger coffee and coffee-dessert fan in recent years. 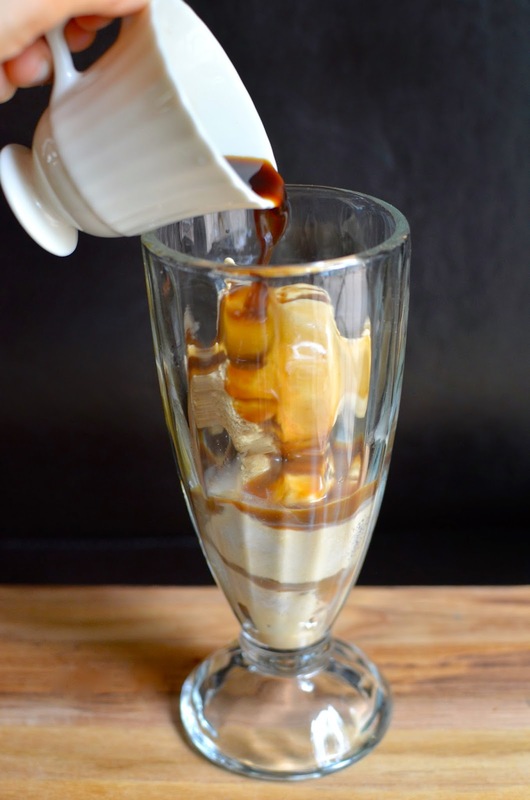 Can't beat an affogato with chocolate gelato but this is fun for a bigger summer treat! Wish I'd come up with these things! : ) Have a great weekend! I'm a big fan of your boys, my friend! : ) They obviously have excellent taste and speak their mind. Here's to more desserts on your blog to look forward to! Yum! Affogato is one of my favorite way to enjoy dessert. :) Love your chocolate sammy too! What a great combo! Crazy combo and totally works! Thanks, Amy. This sounds like the perfect lunch/afternoon treat for me!! :) Both of these look amazing!! I'm not too much of a fan of affogato, because the versions I've had at restaurants are always too strong in coffee flavour for me- but I think I'd love your because the ratio of coffee to ice cream and milk sounds perfect for me! Grilled chococlate sandwiches??? What a brilliant idea! I cannot decide whether I like the affogato of the sammie better - both look terrific! What a perfect afternoon snack! Thanks, Consuelo! I couldn't decide either so I just made both. Can I tell you how ABSOLUTELY in love I am with both the affogato float and that grilled chocolate sandwich????? The affogato sounds like a coffee extravaganza and I have only recently purchased my first ever espresso // cappuccino machine and I have never been sooooo excited so I am going crazy with coffee and this is just perfect for me to get even crazier! <3 OMG the grilled chocolate sandwich is making me drool! There's a cafe in my locality where they actually serve grilled nutella and cheese sandwich! Sounds gross and something that is enough to give you cardiac problems but it is soooo worth it! I am totally making this sandwich with dark chocolate !!!!! Why NOT have dessert for lunch?! This is such a fun meal and I'm sure your little guy loved it!! You're my kind of girl! Hi Monica, I bet this was a big hit in your household. Looks delicious! It was such fun, Cheri. Thanks! Oh YES! Let's go crazy with desserts. They both look to-die for. Gorgeous ideas! Thanks so much. It was definitely easy to eat. haha - just cut that sandwich to tiny portions and share that affogato...it's "lighter" than most shakes. Your dad is one cool dude, I bet. I need to start having meals like this asap. And seriously grilled chocolate sandwich? Can there be anything better in life than this? I know...such a fun idea, I think. Thanks, Pamela. I've never tried a float! Crazy right!? Apparently there's lots of things i haven't tried! But i think its time to give this recipe a try:) I'll let you know how it goes! Monica, Monica, Monica - you have sold me on both of these recipes! I have never had either one but will make it my life's mission - haha. That sandwich does look and sound amazing. 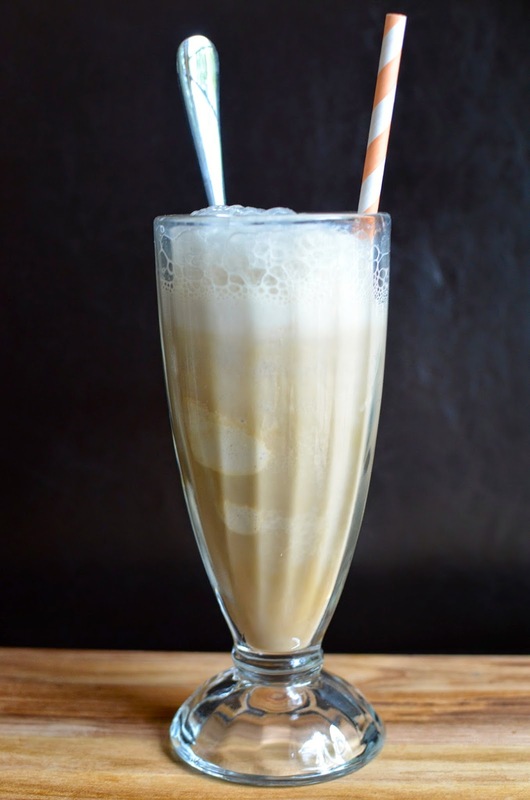 My husband adores root beer floats and loves coffee - so this would be a special treat for him. Thanks! Hope you are doing great. haha - thanks, Tricia! You would make some beautiful grilled chocolate sandwiches, I know!! Mmm grilled chocolate sandwich does sound delicious! I'd totally go for it! Salty and sweet with a little crunch is my favorite combo. I totally wanted to make it to see my son's reaction, too. It worked out well.